Kickboxing is a cross-system martial art, which has its roots in the USA and came to Germany in the mid-70s. As the name states, it combines boxing and the kicks (from asian martial arts) to reasonable combinations, to be able to hit the opponent in a fair and sportive duel, without to be hit by the opponent. The fusion of fist- and foot-techniques in Kickboxing requires a good technical knowledge, a good endurance, a refined knowledge of combination and spontaneous reaction for a sportive and fair tournament. It can be seen as a very effective self-defense system and is fit for male as well as for female fighters. In tournaments there is a mandatory equipment to protect the health and safety of the athletes. In full-contact-fights, depending on the individual rules, lowkicks (transferred from Muay Thai) can be used. Agility and body control are trained as well as endurance, reaction and combination-capability, since they are essential to the study of the techniques. Muay-Thai (Thaiboxen) is more than just a sport, it is a martial art, or even better a art of war from Thailand that is over 2000 years old. In times of war there was often a lack of "good weaponry". Therefore the Thais had to win through close combat. To survive they had to apply efficient techniques. The spiritual background is the thing that forms a real martial art. The way, asian martial arts use to reach that unity, is by discipline and concentration. The spiritual basis is called Rammuay (boxing dance) or Wai-Kruh (the bow to the master). With this dance-like ritual, a fighter renders homage to his trainer and/or master. Also he pays respect to Buddha and King Rama (the king of Thailand). 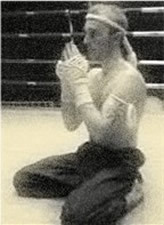 Furthermore during the Rammuay / Wai-Kruh the body prepares physically for the fight (stretching). Usually every fighter knows the Rammuay / War-Kruh of its dojang. This way it can be seen, which dojang he belongs to. A important part of Muay-Thai is the traditional head- and armdress of the thaiboxer. They are called Mong Kong (head crown) and Prajeat (bracelets). Before the fight the Mong Kong is given to the fighter by his master. In the past the masters were writing good wishes on it, to grant the fighter the blessing of the master and of Buddha. During the fight the Mong Tong isn't worn. Only the Prajaet on the arms are worn in combat. They symbolise strength and are supposed to be a protection against heavy knee- and elbow-blows. The Muay-Thai is related to kickboxing, but is even more effective. 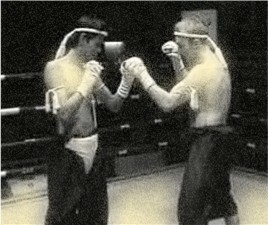 In Muay-Thai, in addition to kicks and fist-techniques, elbow- and knee-blows are allowed, which makes Muay-Thai very effective in close combat. Because of this, Muay-Thai is known for centuries as one of the toughest martial arts. In Thailand this martial arts is a national sport, which assures a living as a tourist-attraction for a lot of people there. In contrary to the past, good fighters can earn a lot of money now. In Thailand the fans of this sport know nearly any boxer and are betting on their favorites. They are following the fights with passoinate interest, either live or during one of multiple tv-broadcasts every week. The I.C.B.O. sticks closely to the Thai rules. This means elbow and knee-blows to the head are allowed. The fight isn't suspended immediatly. In title-fights the fighters have to perform the Wai-Kruh. The Muay-Thai is not just a tournamest-sport, but also a very effective self-defense. For this very realistic and intensive sarring-matches are used to optimise the accuracy and to train the agility and the reflexes. It is told, that early immigrants from south-china brought this martial art to Thailand over 2000 years ago, but there are no exact documents prove this. There are rumors that they had the intent to aid the Thai resistance in many battles. In any case it is sure, that this art of fighting was developed during war with the neighbouring nations like Korea or Vietnam. Muay Thai is deemed to be one of the toughest martial arts in the world. 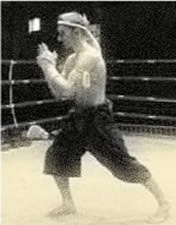 In fights it is normal to use elbow-, knee-, fist-, and foot-techniques. The holding (Clinching) and throwing of the opponent is a important part as well. Since this art was so successful, a training style was developed pretty fast, which was also adopted by the local army. As the trainers became more experienced, they teached the fighting-style in the whole country. Around 1700, in Thailand there were fights in front of temples, on carnivals and during other events. After that Muay-Thai spread his reputation as tournament sport in the whole country. It was used to organise fights for religious festivals. After that, the golden age of the Muay-Thai followed. A king by the name of Rama was interested very much in these tournaments and decorated a lot of good fighters. He continously looked for new talents and established many training camps for thaiboxing. Nai Konom Dton was one of the most successful heroes of Muay-Thai. Burmesian groups took him prisoner, but he should be set free, if he was able to defeat the 12 best fighters of Burma. He mastered that task cleverly and made for a lot of excitement and reputation. Until today ceremonial fights are held in his honor. The first official ring was used in 1921, in 1929 boxing gloves were introduces for the first time. Before this the fighters only had hemp bandages. A jockstrap was made from coconuts, or a variety of cushions. In 1945 the first stadium was built and numerous champions in different weight-classes were determined. Soon after that a second stadium was erected. Both these stadiums are principal theaters of profesional Muay-Thai today. And the martial art was continously developed. In april 1993 the Amateur-Muay-Thai, which was nearly unknown until then, was intensified and the International Muay Thai Federation (I.A.M.T.F.). It has the full support of the Department of Physical Education, also knows as the Thailand ministry of education. The organisation aims for spreading the Muay-Thai in its original form in the whole world. In the amateur-area fights with protectional equipment were introduced. In professional fights mouth-protection, jockstrap and boxing gloves are still the only protection. Amateurs can extend the equipment by head-, elbow-, torso- and shinbone-protection. The professional league was organized by the World Muay Thai Council (W.M.C.). Because of the founding of proper organizations, in Thailand as well as in the rest of the world, it became possible , and it is also practiced, to propagate the great art of Muay-Thai in the traditional way.